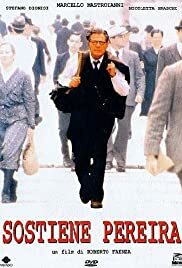 I'm a bit disappointed by this movie adaptation of Antonio Tabucchi's Sostiene Pereira (Pereira declares), an Italian modern classic novel about an old Portuguese journalist who decides to not stand watching but to intervene, in his own little way, in a difficult historic moment (the story is set in 1938, on the eve of WWII), compromising himself. It's a great story of heroism and courage. What I didn't like about the movie is the key adopted to tell the story, I find it too comic and slight compared to the importance of the matter dealt in the book, the novel's tone is serious, Mr Pereira is a dramatic character, whereas the Pereira played by Mastroianni is excessively tragicomic to my way of thinking; there's a few hilarious moments in the book but they never appear as forced as they do in the movie. In general the story's register is gloomy, however this gloominess was lost in the movie. Nicoletta Braschi is another reason why I didn't like this movie, she's absolutely terrible in it, she drones on all her cues, she seems to be reading a shopping list all the time! The score composed by Ennio Morricone suffers from the same misunderstanding that affects the movie in general: the interpretation key is wrong for me, this kind of musical approach would have been more fit for a comedy than for a drama, it's a sort of funny piped music with no substance, it's absolutely unable to play the dramatic sequences up. Nevertheless what's in the book you find in the movie, the message is safe but where's the spirit? where's the atmosphere? All that remains of the book is its didactic value, but I think there's much more in it. The only sequence where I found the book spirit is that one set on the train, where Mrs Delgado (Marthe Keller) asks Pereira to not stand watching but to act in any way he can.